Acquastone is a business to business design studio supplying direct from the manufacturer an extensive range of architectural tiles including mega size slabs, facades and swimming pool solutions. A new introduction of luxury hand built British kitchens and expertly crafted bathroom design and supply has been received favourably by its clients. 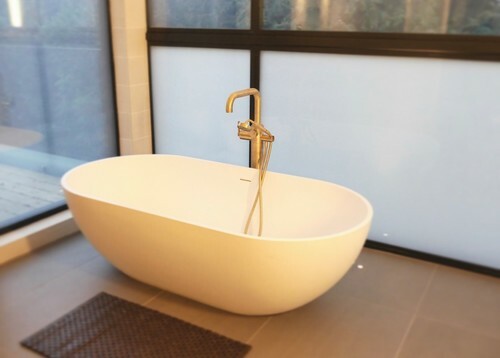 Stunning large bathroom in a simple but effective style, using different format tiles - bringing the feel of the outdoor space in using large panes of switch glass as privacy screening. 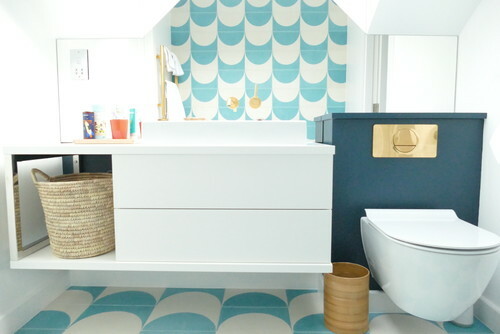 Handmade Moroccan popham design tiles beautifully shown with an Italian Blu Bleu freestanding bath tub with a customised RAL colour to match the theme. The brassware was all plated in a brushed matt gold finish and vanity. Decor Slabs, changing the purpose of tiles altogether. Having worked as the only female at board level for a complex group of companies in the Middle East, Hina is known for her careful attention to detail and ability to find solutions to complex problems using a very analytical approach.